The objective of this paper is to investigate the response of a cold-formed steel framed building subjected to earthquake excitation primarily through nonlinear time history analysis employing the incremental dynamic analysis (IDA) framework. 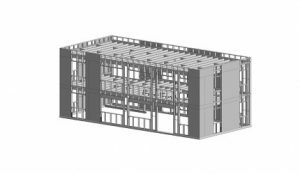 The two-story archetype building from the Cold-Formed Steel – Network for Earthquake Engineering Simulation (CFS-NEES) project is analyzed using OpenSees. In the current ‘state-of-the-art’ model, fully nonlinear hysteretic pinching models for the shear walls are parameterized directly based on shear wall test data conducted as an earlier phase of the CFS-NEES project. Nonlinear behavior of the shear wall hold downs in tension and compression, shear anchors, and rigid diaphragm are also captured in the model. The normalized far field ground motion suite from FEMA P695 is employed as the input excitation. A series of analyses using scaled ground motions are completed up through large enough drift levels to insure collapse in the building models. The IDA procedure provides information about the performance of the building under general earthquake loading so that drift and other limits for collapse prevention (i.e. loss of stability for the building) can be explored. Comparison of the predicted inelastic base shear vs. elastic base shear provides a direct understanding of the relationship between IDA analysis and seismic response modification factors (e.g., R or more specifically Rd) as utilized in design practice and within the FEMA P695 procedure. Further refinement of the building model is underway; particularly, with respect to modeling the gravity framing, diaphragm, and non-structural elements. The fully developed model will be calibrated with test data from full scale shaking table tests of this building to be conducted in the summer of 2013. Modeling and analysis guidelines based on the sensitivity of the results to model fidelity will be developed as a resource to promote simulation in seismic design of cold-formed steel buildings.